Now there are several mobile browsers in the market. Most of us know Opera mini, Safari mobile and other default mobile browsers in our handsets. However, there are few other mobile web browser applications, those in some terms are better than the default web browsers. For example, Skyfire and BOLT are two apps that can stream YouTube, MetaCafe and other streaming videos within web pages. 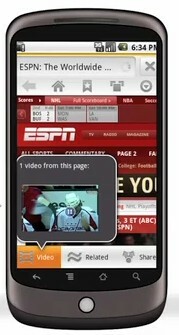 Whereas Opera mini and others open an external media player to play FLV videos. Skyfire is completely free and works with Windows mobile, Android, and Symbian handsets. The new version of the browser, Skyfire 2 is now available for Android devices. Skyfire 2 introduces features like multi-touch, SkyBar, visual tabs etc. that makes browsing much better on Google Nexus One and other latest Android phones. Skyfire 2 for Android is totally different from the versions for Windows mobile and Symbian. The browser has a cool new design and features that would beat most mobile browsers in the market. Skyfire 2 supports multi-touch in all Android phones with OS 2.1 or later. It can open web pages in visual slider tabs up to maximum 8 pages at the same time. Skyfire 2 uses cloud technology to compress videos and images before they are downloaded to mobile phones. There by the speed of browsing will get increased at lower data charges. The newly introduced SkyBar in Skyfire 2 makes it easy to find videos, images in a web page and play or view them much faster. SkyBar is a toolbar found at the bottom portion of Skyfire 2 browser. All those videos in a web page are collected at video tab of Skybar, so that users can play them without moving through the whole page. The Explore tab in SkyBar pop up several related links of a topic selected on a web page. This includes images, tweets, latest blog posts related to that topic in recent days. SkyBar in Skyfire 2 software also has an option to share website links to social networking sites like Twitter, Facebook and others. Skyfire 4 is now available for download at Google Play store here, Apple iTunes store here. Skyfire version 1.5 is now available for Windows mobile and Symbian mobile models. We expect Skyfire 2 version for these OS platforms, any time soon.